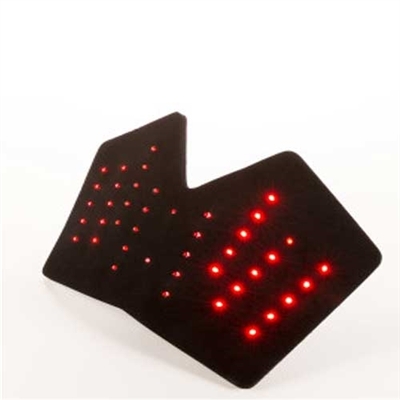 The Ankle Saver has 42 red diodes, designed specifically to wrap the ankle. Diodes are placed over the suspensory ligament just above the sesamoids and over the medial and lateral branches that pass over the long pastern to connect to the extensor tendon. The light Stimulates the deep and superficial flexor tendons just above the sesamoids. Other areas stimulated by the Ankle Saver are the sesamoids themselves, the distal sesamoidian ligament, the medial and lateral aspects of the joint as well as the front of the joint. Place the cupped part of the Ankle Saver on the back lower part of the ankle with the control box toward the outside of the horse (not between the legs). This will help protect the unit from damage. This should cover from the sesamoids down to allow the ergot and long hair around ergot to be pulled through slit if necessary. The on and off buttons are the same, located on the control box. Press the button for 2 seconds to turn on. The indicator light is located across the "R" on the control box. The GREEN light illuminates when the unit is ON. Replace the batteries when the diodes become dim, or not as briht as under normal use. Note: The unit will operate for a while with low battery condition, but it is not advisable to run the batteries completely down as they may leak acid and cause damage to the unit. The recommended treatment time is twenty minutes, but by popular demand, the unit stays ON for thirty minutes. It is okay to treat twice a day if necessary, depending upon the severity of the injury. Protect your investment: the unit may be damaged if the horse is left unattended or allowed to walk or run around during the treatment. Battery Replacement: unscrew the two screws located on the control box. use a small phillips head screw driver. Be careful not to strip the screws. remove the cover and install new batteries, and replace the cover.